To start adding products to your site, go to DropshipMe 'Import Products' section. Here you need to select a category and a subcategory from the dropdown menu. You can look for the necessary products using keywords. You can sort out the search results by relevance, price and order count. Choose the necessary option from the Sort by dropdown menu. Before starting importing products you can apply some import settings and product filters. Click on a blue gear button to view the collapsible sidebar. Create categories from DropshipMe - if you don't select a category from your site and activate this option, the plugin will create and add the same category presented in the DropshipMe database. Remove item specifics - use this option if you don't want to import product attributes like brand name, material, style, item type, etc. Publish products - if this option is enabled, the products you import will be published right away. Otherwise the items will first appear in your import list that you can publish them later. Import with recommended prices - activate this option if you want the products to appear on your site with recommended selling prices (with your profit margin included). Supplier price - select price range in the currency of your site. 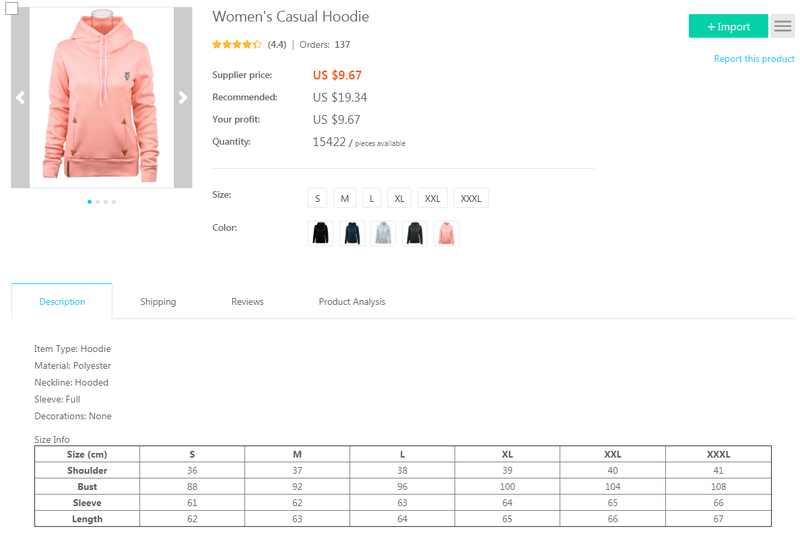 Orders - set the required number of orders for the products. Shipping from - use this option if you need products stored in warehouses in China or United States. Shipping to - select the country of destination from the dropdown menu. Shipping method - choose the necessary shipping method here. Free shipping - tick this box to filter out products with free shipping available. Select a category to import products to. You can import products one by one using Import button. If you want to import more than one product at once, tick the boxes or select everything and click 'Import selected' button. If you imported some product, but then deleted it, your import balance will not be restored. But you can import this product again using Re-import button. It will not affect your import balance. Pay attention that if you delete your WordPress database on your hosting, you will not have the Re-import button – all the products imported before will be shown with Import option only. Please note that we cannot guarantee that all products that you imported to your store will be available on AliExpress forever. From time to time some products may disappear from AliExpress as their listing date has expired or the listing policy has been somehow violated by the supplier. 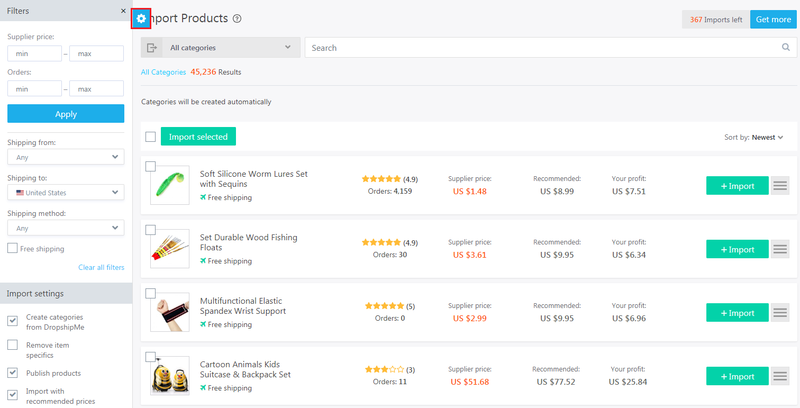 If the product disappears from AliExpress, it accordingly disappears from DropshipMe database and hence from your site, such things can happen to dropshipping stores. Anyway, it happens very rarely and cannot do any serious harm to your business. Besides, we provide additional bonus product imports to each product package, so you can add something new instead of the disappeared product.